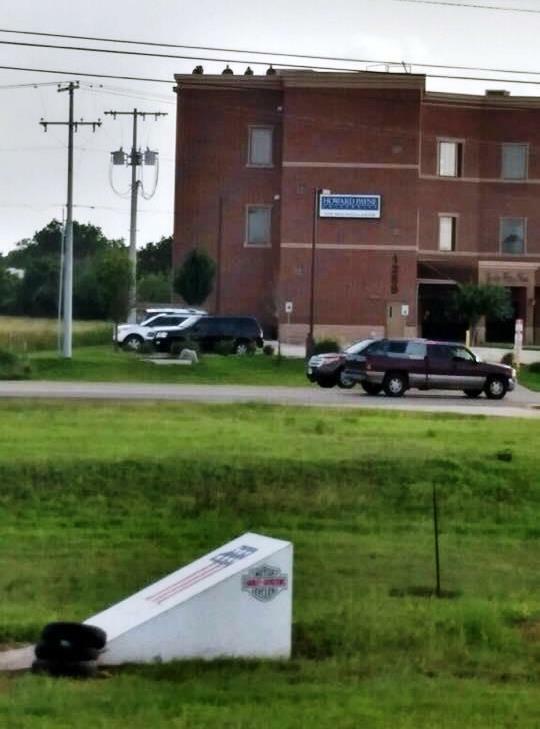 Photos on a Facebook Page called Free All The Waco Bikers clearly shows police snipers on an apartment building rooftop, across the street from Geuene Harley Davidson in New Braunfels, south of Austin. They were a hosting a memorial service for Jesse Rodriquez, a decorated Vietnam vet who was known to fellow bikers as “Mohawk,” and frequently did charity rides with his wife. He was shot and killed at Twin Peaks in Waco on May 17. It's unclear why snipers were in place. Many who knew Rodriguez-a father of 7 and grandfather of 19-have disputed that he was a criminal. According to the New Braunfels Heralnd-Zeitung: Vincent Ramirez said media outlets have portrayed his father, Jesus "Jesse" Delgado Rodriguez, 65, as a bad person, and that's not just inconsiderate - but wrong. And he insisted his father was not involved with any biker gang. "I don't want people to be categorizing my dad. That's not the kind of man he was," Ramirez said. "He was a veteran. He fought for his country. He was a family man. He loved to ride his motorcycle. He rode with all kind of groups." Reports about Rodriguez being a member of the Bandidos motorcycle gang are false. Rodriguez knew some Bandidos, sometimes rode with some and bought patches in support of some of their benefits, Castillo said. "He wasn't a violent person at all; he was a loving person," Castillo said. "He never carried any weapons. He just happened to be in the wrong place at the wrong time. He was an innocent bystander." The photos posted shows police snipers on two rooftops directly across from the Harley-Davidson dealership that hosted the event, which included a raffle, food and music. You can clearly see by Google Maps that the apartment building shown in the photos is indeed directly across from the Harley dealership. This is the second time in less than a week that snipers have been posted outside the Harley Davidson dealership after the Waco incident. The second sniper incident was reported this past Saturday at Longhorn Harley Davidson in the southern Dallas suburb of Gran Prairie.